The audiovisual performance reconsiders the guitar hero myth by replacing the old device with "neon guitars". 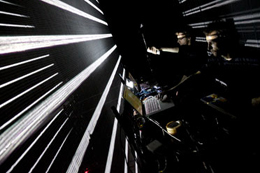 Both intimate and surprising, Euphorie plays on the spectator experiences in contemporary theater as well as in electronic music, offering the audience a brand new approach. This performance consists in the treatment of the analogic video signal through amplifiers and modified signal mixers. That signal simultaneously controls sound apparatuses specially built for the presentation, creating a certain synchronicity in certain moments. Both sound and images are crude and unexpected, a transit among pure, vibrating colors, and sub-bass frequencies. It’s about result of an extended research where physical phenomena as visual persistence and additive relaxing are explored. 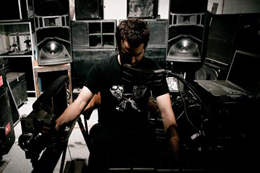 Tristan Shone is a mechanical engineer, sculptor (MFA, UCSD, 2007), sound artist (Author & Punisher) and creator of the Drone and Dub Machines industrial sound controllers. 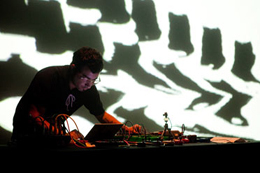 Author & Punisher is an industrial doom and drone metal, one-man band that uses primarily custom fabricated machines/controllers and speakers. These machines draw heavily on aspects of industrial automation, robotics and mechanical devices that he encounters through engineering work and sound machine fabrication. The devices focus on the eroticism of the interaction with machine, but also with the musical sensibility of doom, dub and heavy drone influenced music. 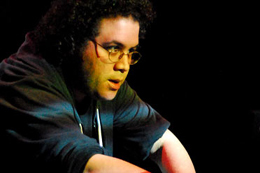 Using old videogame consoles and obsolete computers, Pulselooper makes electronic music full of beats and bases more heavy and distorted than the usually extracted from last-generation hi-fi equipment. This work goes beyond low fidelity to present tracks in low resolution, transiting through breakbeat, techno, ambient music and other versants of electronic music, all in 8 and 16 bits. The result of that retro paraphernalia is a combo of raw, brainily and dancingly blips and blops. Long-time 8bitpeoples member, Minusbaby, born Richard Alexander Caraballo in New York City, serves nebulous ambrosia, blushing dissonance and surprises. While it may be impossible to predict what will happen at each performance, one constant can be expected: a forceful equatorial beat with a bassy bottom end to make anything bump and bounce that hasn't been tied down, exploding the very meaning of 8-bit orchestration. When we go to an electronic-music show, whoever may be the artist, we have the intention of watching a good presentation. And if this happens we go back home happy, and later on we tell our friends that it was a very good show and they should also see it. Hypersonica Meeting happens as a space beyond the presentation of performances or shows; it is an experimental event in which anyone may deliver work proposals in DVD or CD to the team of Hypersonica Rio 2011, expose their views and have a direct contact with the festival's guests and production. 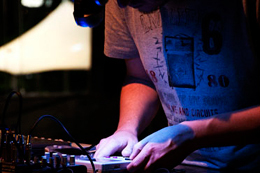 In the programme, artists who build their own instruments with different materials and techniques, proposing contemporary forms of producing sonorities. To take part in the meeting and see the presentations, it is necessary to present an invitation, which is personal and valid for the 3 nights of the event. Subject to the capacity, by order of arrival. 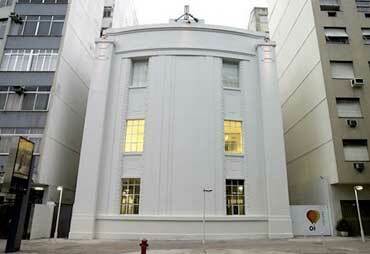 The space accommodates 200 people, but only 80 sitting in the theater. To guarantee your place, Hypersonica's team will provide each day individual passes for the first 80 people that arrive to the space starting from 7 p.m.
Hypersonica Meeting Rio 2011 happens at Oi Futuro - Ipanema, from April 01 to 03, 2011. Here you will find the testimonies in video from the event's participants, as well as the recording of the three nights of meeting.